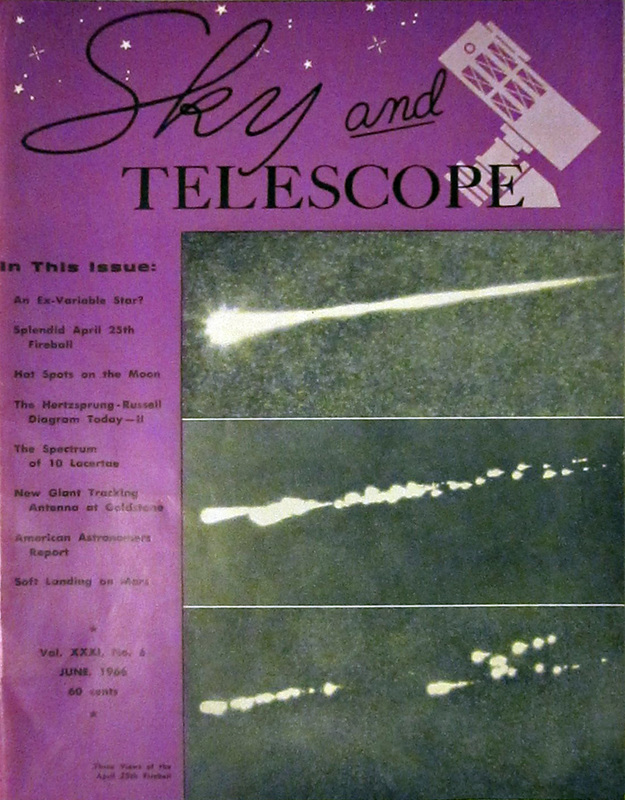 After writing of my fireball meteor experience as a kid below, I did a little digging and found out I was wrong about two things: First, I was actually a few months shy of my seventh birthday when it happened, which, thanks to the fairly amazing web, I discovered was 7:14pm Eastern Time on Sunday, 25 April 1966. Second, the fireball lasted almost 30 seconds, not 8. I knew it was visible for a long time, and my friend and I saw it from the start, but I was being conservative with my recall. Because I remember us shouting – likely pretty tame stuff like “Holy crap!” – and, I think, leaping up and down for quite a while, my recollection was 20 seconds or more, but I doubted that as I wrote the post because even 10 seconds is a long time for any meteor to be visible. I shall trust my memory more in future. It was called the “Great Fireball of 1966” and was widely seen on the East Coast of the US and in Canada. It was a bolide – meaning it broke up as it sped in – estimated to be 5-10 feet across, and since it wasn’t part of any expected meteor shower, it might have been a small asteroid. 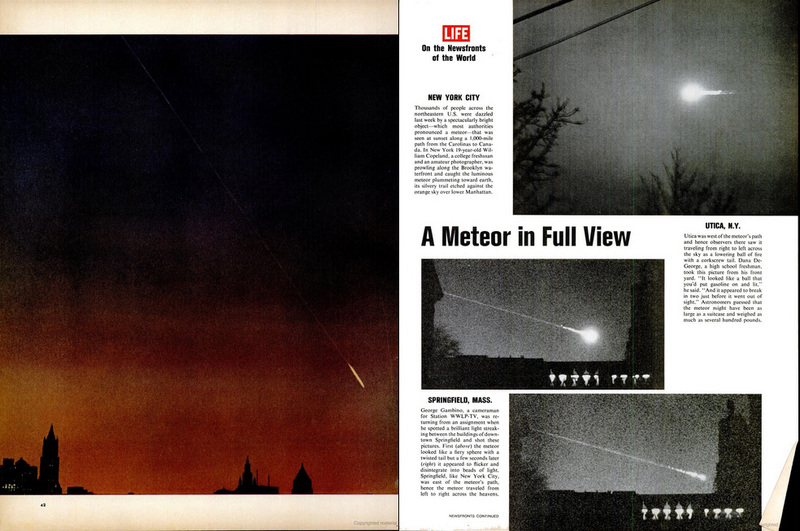 It was written up in Life magazine and Sky & Telescope at the time – pictures from those issues below. When we saw it, it seemed to be only several miles above us, maybe forty or fifty thousand feet, but the show actually began near the Kármán line, commonly accepted as the point space begins, 62 miles/100 km up. Its initial altitude of 327,000 feet explains why it seemed to move fairly slowly. A research paper dissecting the meteor was published in the Journal of the Royal Astronomical Society of Canada and is available here. 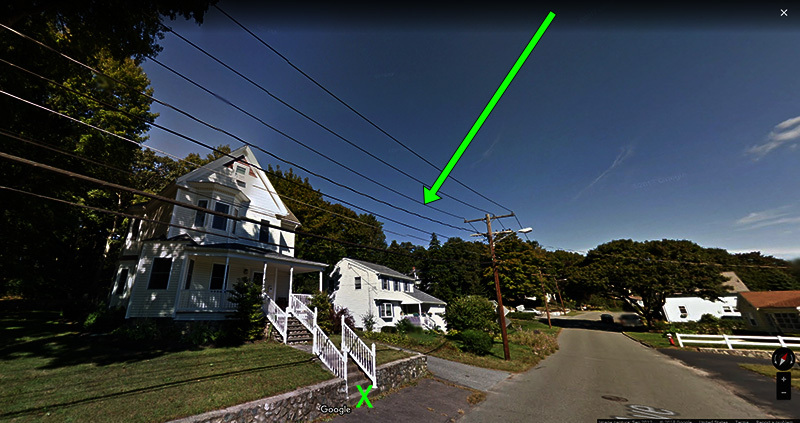 I said in yesterday’s post that I could show where we were and the path of the meteor, and so I can with Google Street View. My house was just to the left of frame here, and we were next door, sitting on the steps at street level at the green X. I’ve darkened the sky in this image to approximate the light at the time, and the color of the line in the sky is just about the color of the meteor we saw, except it was matchhead-bright, of course. I can’t recall precisely if it went below the horizon, but I believe we did see it breaking up toward the end. This photograph, iconic at the time, came to be known as “the picture of the century” and it’s hard for me to disagree. 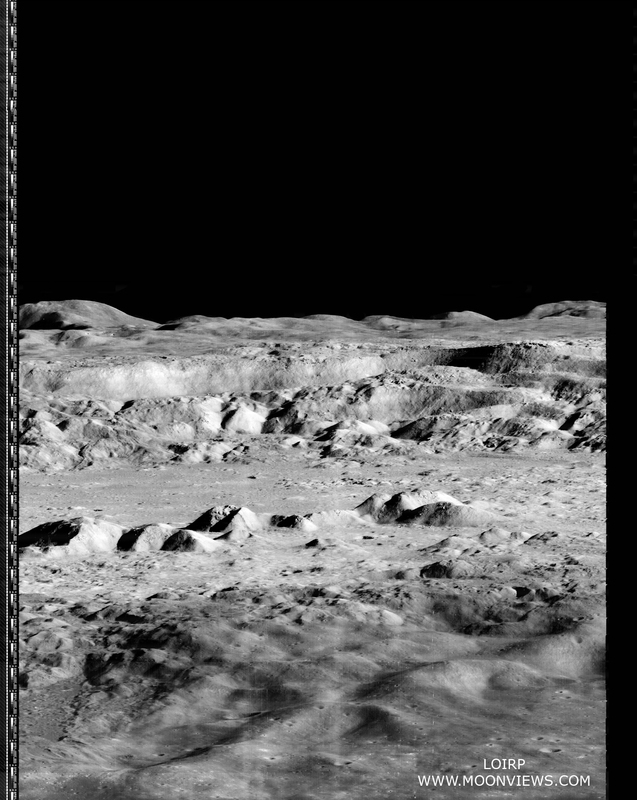 It was taken from an altitude of 27 miles/45 km and 200 km/125 miles away from the centre of the crater. No one had seen such a spectacular view of the moon before. The funny thing is, the photo was entirely unintentional. They simply needed to advance the film in the onboard camera, so they fired a couple of “housekeeping” exposures – random ones as far as they were concerned, but just look at what they got. That photo was mind-bending for me and made more concrete the prospect of people being there, which would happen in just a couple more years. 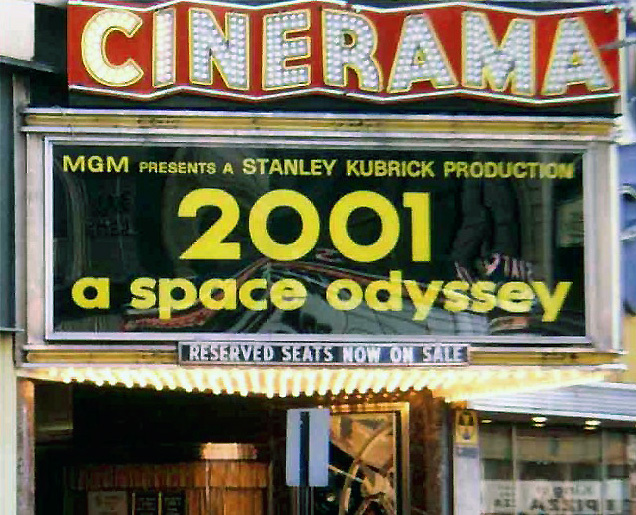 Before that happened, 2001: A Space Odyssey was released in April 1968 and I saw it at its Boston premiere on a huge, curved Cinerama screen perhaps seventy feet wide. Eight months after that, Apollo 8 carried the first men to leave the Earth and orbit the moon. And then it just got better and better from there. It was one helluva time to be alive. 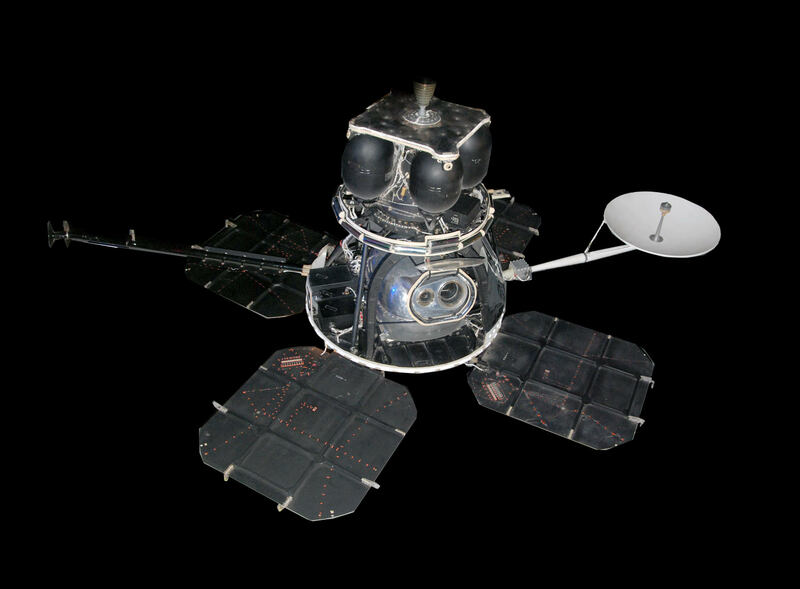 This entry was posted in Space and tagged Great Fireball of 1966, Meteor. Before that happened, 2001: A Space Odyssey was released in April 1968 and I saw it at its Boston premiere on a huge, curved Cinerama screen perhaps seventy feet wide. You and I were in the same theater at that screening, my friend. Granted I was younger, but my mom had finalized her divorce at the start of that year and she was dating a man who lived in Cambridge. He’d gotten tickets and we went down to see it and were about 1/3 of the way back, in the center. The bit as Dave falls into the gateway just about did me in, and to this day it is one of the most visceral memories I have of anything I’ve witnessed. Full stop. Was the old RKO theater if I recall. Was the largest screen I’d seen until 1977 when I went to a 70mm theater in Phoenix and saw Star Wars.. sat so close to the front, the edges of the screen were almost 180 degrees side to side. I love huge format films, and used to buzz down to Boston to the Museum of Science to see OnmiMax films all the time, and yes, I miss that Jordan’s Furniture took out their 15/70 projector systems a few years ago, and those are the absolute gold standard for image resolution – the equivalent of 18K. I read last year they have recently installed a new laser rig that runs paired 4k systems on one screen. Hm. Haven’t been to a film there yet. Contrast that to the current Cinemagic IMAX theaters out in Hookset or up in Saco with screens that are 4K digital projection. I mean yeah, it’s better than the Regal Newington Cinemas googleplex of postage-stamp sized screens.. Gah! I really missed the ball when Interstellar came out – gotta love Christopher Nolan and his use of IMAX film. Am probably going to go to NYC this spring and check out Avengers: Infinity War in 3D [which was shot using a system called Alexa 65 which has a HUGE CMOS sensor that outputs 6500×3000 (6k) or so] at the AMC Loews on 34th street in Manhattan. That is the largest IMAX screen left that is north of the National Air and Space Museum in Washington DC which shows Hollywood releases. (though Jordan’s may be larger and now with the laser.. will need to check that out and start going down that again) I think there’s an aquarium in Norwich that’s got a 60-footer tall screen, but it probably only shows documentaries like the Museum of Science in Boston does. Big screens, 3D – that’s my cinematic monkey bone. Given me seeing 2001 where I did and at the age I did, is it a wonder? Absolutely an AMAZING time to be alive, it is..
Every time I get a new TV, it’s a little bigger, so the first thing I watch is always 2001 – after dark, of course, with the neon Boop standup and clock in the kitchen next door shut off and the TV’s rear bias lighting unplugged. It’s now at 50″ and that’s the maximum comfortable size for my living room, so the next upgrade would prolly involve a trip to Seattle Cinerama or somesuch. I hate going somewhere for just one thing, though, and the not-on-the-menu Lunar Orbiter dessert at the Space Needle Sky City restaurant doesn’t really count as a full second thing to do. That’s all moot, though. Still paying my very last credit account down so I can be debt-free by the end of this year. That hasn’t been true of my finances since I was 18 years old. I must toe the line I drew, so no trips for me. You know, I may have to get a copy of 2001 and give our 50″ not-so-smart* TV a whirl. Have been a bit under the weather for the last few and that sounds a fab way to pass the evening.